Eek! Thanksgiving is over and that means it’s officially time to start blaring the Christmas music and getting in the Christmas spirit! Andy Williams got it right when he claimed it was the most wonderful time of the year. Truly, it is one of the most magical and miraculous times of the year that we will celebrate, am I right? Does anyone else get as giddy as I do about advent? Advent simply means the arrival of something or someone notable. In our house, that means we anxiously wait and prepare our hearts for the arrival of our savior’s birth. That calls for some BIG time celebration! Not only are we preparing our hearts for Christmas, but as a family, we are trying to prepare our children’s hearts to receive Jesus even after December 25th. The most wonderful time of the year goes FAR beyond the man in the big, red suit pulling a sled with eight tiny reindeer. We get to celebrate with real angels in heavenly places and celebrate the God who can raise us from the dead. Now that calls for even more serious celebration! I am always looking for fun and engaging ways to point my children to Jesus. In our house, we want to point our children to Christ and not to the idea of Santa. As a parent, I had to make the hard decision of saying no to the idea of him. For me, I knew it would be too easy to get all caught up in the story with all of the magic and fun that went along with it. I don’t think my heart would have been able to make the most room for Jesus. And yes! Of course you can still incorporate Santa into our Savior’s birth! Santa believing or not, it’s what your family decides. There are so many fun things that you can do with your children to anticipate the arrival of Christmas! I have never done Elf on the Shelf, but it looks SO fun! There are so many creative things that people come up with. Growing up, I knew the Christmas story, but I cared more about what I got under the tree than anything else. I want to get my kids even more excited about what Jesus can do rather than what any Elf on the Shelf activity does. I want it to be SO much more fun than a silly ole’ elf claiming he can poop out candy tootsie rolls and mini Hersey kisses! Before we knew about all of these AMAZING alternatives, I was just hiding an old beanie baby Christmas Angel and writing my own ideas to go with it. After I found these wonderful alternatives, I could not believe that I didn’t have to come up with all of this stuff on my own! This is Angelica, our Angel. You don’t need Elf on the Shelf to create a fun and engaging Christmas. There are meaningful and exciting activities that will excite and encourage your child to participate in the celebratory reason for the season. Whether you celebrate Santa or not, there are some amazing alternatives for everyone! If you find that doing an advent activity each day is too overwhelming and unrealistic, ( it is for our family) consider reserving your advent activities one night a week when all of your family is home. We like to read a passage from an advent devotion and then hide our Angel around on Sundays and reserve the activities for each Sunday of the month until Christmas day. Participating in fewer days allows me to feel like I am still putting in the effort without feeling overwhelmed. If you have older children, you can replace the plush dolls for a more mature item such as a wood carving or unique piece of art such as a fair trade nativity set like this. On the first day that you introduce your calendar, think of a fun way to get them excited about the idea. If you are using a calendar with an angel as your guide, make a set of angel wings for each child or watch a movie that has an angel in it. If you are using a donkey, jump on Youtube and watch a short video on donkeys or on real shepards that you may see today. You can even read the nativity story and have your children guess which character will be joining you on your advent adventure. The Shepard on the Search is a playful, Christ-Centered hide and seek game that encourages children to explore the true meaning of Christmas. Find the hidden shepard each day with a Christ-Centered booklet and CD. Follow along on the quest to Bethlehem! Purchase it at Chistianbook.com or visit their website above for more details. There is a CD and read aloud story that can be purchased separately here. The Shepard’s Treasure is another faith based alternative similar to Elf on the Shelf and The Shepard on the Search. Name him and hide him! Read with him and embark on his journey to find the greatest treasure of all! Check out their website for creative ways to use the Shepard’s kit and watch the how-to video. “I love all who love me. If you are looking to restore the spirit of Christmas in one message, then look no further than the Christmas Angel. Just when you thought that Christmas was magical enough, introduce your children to this real alternative that goes far beyond that jolly ole’ soul pulling that red sleigh with his eight tiny reindeer! This activity gives you the option of purchasing a boy or girl plush angel. It’s main purpose is to instill the joy of giving to others. Visit the website to purchase and watch the how-to video here. Similar to The Christmas Angel, The Little Christmas Angel is perfect if you are just starting to introduce the Christmas story to young toddlers and infants. A young audience will enjoy these illustrations and the storybook message. You can also purchase online at amazon.com. We purchased this book last year to do as an advent family devotion, but we never got around to it. We are going to try again this year! This cute box set is about unwrapping each character from the Nativity story and hearing from them on that holy night. If your children enjoy unwrapping little surprises each day, check out this option. If you are also looking for an easy devotion that doesn’t take much effort, this may also be for you. Each day, unwrap a character from the Nativity scene and share the story of each figurine. It only takes the nine days leading up to Christmas to complete. This activity comes in several ways. You can purchase the entire advent kit here or just the book. There is a Spanish version as well. We enjoy the Spanish option because it allows the chickadees to point out all of the words that they are learning in school. This book is so versatile. You can purchase your own toy donkey and use the same hide and seek method that the other concepts have. And, if you really want to go the extra mile, you can also watch some educational youtube videos about donkeys or even make up some of your own ideas to go along with each character. Maybe a game of character charades? Ann has some other amazing books that you should check out here. I do not know much about these books since we do not own them, but many of my friends have these and they highly recommend them. Many reviews recommend waiting to read these stories to an older audience due to the events in the story line. 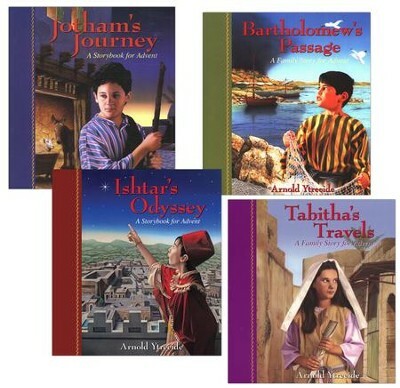 Jotham’s Journey has several other amazing books. Each have a devotion at the end of each chapter. Purchase these individually or as a set. An Easter version is also available. We used the Sparkle Box last year and we will be incorporating it again this year with whatever else we decide to use. It’s such a simple concept that can be used alone or along side another advent activity that your family is already doing. 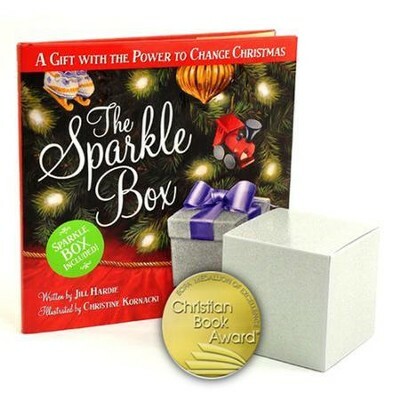 The Sparkle Box is an interactive book about a boy named Sam who participates in random acts of kindness during the Christmas season. On Christmas day, he is excited to open the mysterious box. He comes to find out that these acts of kindness are gifts for Jesus. The book is based on Matthew 25:40. The Sparkle Box has all sorts of supplemental activities and ideas on how to incorporate the book into your Christmas season. We are going to be making individual boxes for each of our kids this year and the older two will be secretly placing acts of kindness cards in someone’s box who is caught doing and act of kindness. It will be fun to open and read what each person did throughout December on Christmas day! They also have an Easter version and we absolutely LOVE it. You can use the Sparkle Egg all year long. We bought ours on Ebay for a whopping two bucks! We decorated these paper mache boxes instead of using a plastic egg. Christianbook.com also carries it. Looking for a modern way to share the miracle of Christmas? The Giving Manger is a very simple yet elegant way to celebrate the true meaning of Christmas. Enjoy the artistic details captured in each page as you fill the wooden manger with manger moments. Place bundles of hay for each act of service you participate in. If you want to channel your inner artist, try to build your own popsicle stick manger like this one or recreate your own mixed media greeting cards using a technique from the illustrator. Look at these cute manager treats you can make! These look so fun! I have never used these, but I have something similar that we use as our nativity play set. 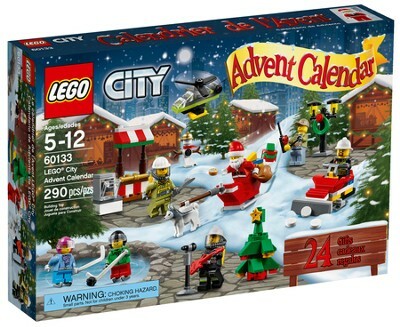 If you have Lego fans who LOVE to build, then this may be the perfect advent calendar option for you! Each day, you get to enjoy building a new gift. It’s perfect for hands on learners! Not only are there themes for both boys and girls, but there are many other themes to choose from including a Star Wars one. Christianbook.com and Amazon.com are a few places to purchase these. If you are looking to avoid Santa, these do incorporate him into the calendar. You can take him out or celebrate the Jolly ole’ soul! Playmobil has a very similar concept to Lego. The difference is that some of the parts are flexible allowing the figurines to do more things with their hands and feet. Check out familylife.com to watch the video about this simple and interactive nativity set. It is perfect for a wide age range of children and includes fun presents to open on the seven days leading up to Christmas. If you are looking for another advent activity that requires little effort, then this is another great option for you. I should have used this last year when my youngest was born. The last present is a mirror reflecting he gift that Jesus wants for Christmas, you! There you have it! Aren’t you blown away just as I was, to find such amazing alternatives? If you are thrifty and nifty like me, check out ebay and amazon for the gently used items. What amazing advent alternatives to Elf on the Shelf have you found?